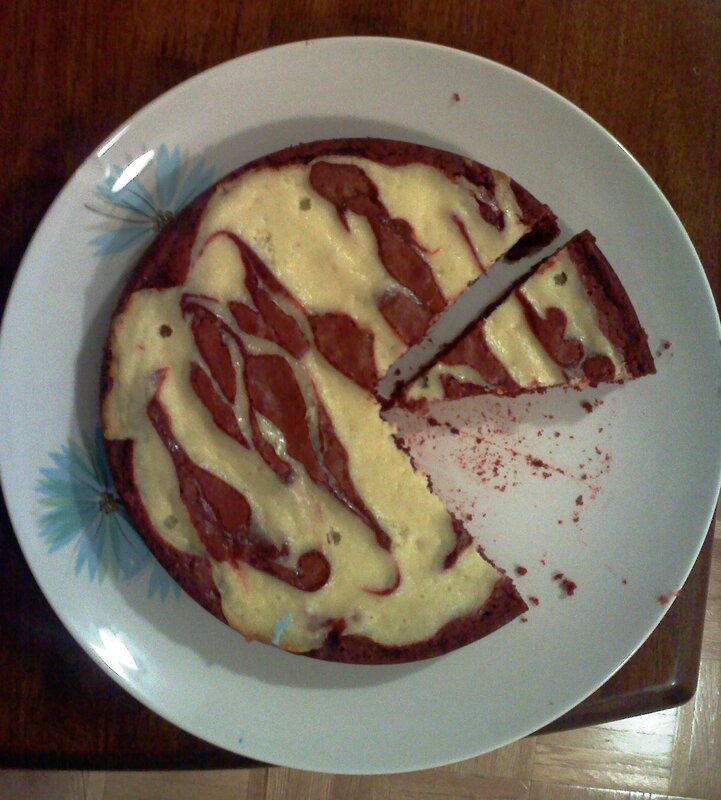 Red Velvet Cheesecake Brownies | Food E.
No, that’s not mold, it’s blue candle wax. I have this HUGE problem, in that The BF doesn’t want me to bake anything but chocolate chip cookies and occasionally BOXED chocolate brownies (never brownies from scratch). No molasses cookies, no cupcakes, no blondies, no muffins, nothing. Don’t get me wrong, I make these things anyway, but they inevitably get stale or the entire batch ends up as that extra 5 pounds on my thighs. It’s starting to become a reeeeeeal problem for me. So for his birthday I said, “Do you want me to make a cake?” He said, “Surprise me!” I said, “Do you want brownies?” He said, “Surprise me!” So I did. I make red velvet cheesecake brownies. Who wouldn’t like red velvet cheesecake brownies?! Probably just runway models and I don’t know any of those. I guess I’ll stick to chocolate chip and boxed brownies. And eat the entire batch of brownies by myself. Note: I still do not own an 8 x 8 pan which this recipe originally calls for, so I made it in a round 8″ cake pan and then cut the brownies into thin wedges. These truly are rich, so you don’t want to cut them too big. Preheat the oven to 350 degrees. Spray an 8 x 8 (or 8″ round) pan with nonstick cooking spray. Set aside. Beat eggs together in a small bowl and set aside. In a medium sized bowl, add warm, just-melted butter, sugar, vanilla extract, cocoa powder, salt, food coloring, and vinegar and stir until combined. Add eggs and stir until combined. Fold in flour until incorporated. Pour batter into baking pan, leaving 4 Tbsp of batter for later. To make the cheesecake: in a large bowl, blend cream cheese, sour cream, sugar, egg yolk, and vanilla extract with an electric mixer until light and fluffy and completely blended. Drop the cheesecake batter on top of the brownie batter in large dollops. Add your reserved brownie batter in dollops on top of the cheesecake. Use a sharp knife to cut lines across the batter until you have a lovely swirl pattern. Bake for 28 – 30 minutes for a square pan, or 30 – 32 minutes in a round pan. Test with a toothpick to make sure it comes out clean. Let cool completely before cutting. Note: this should be kept refrigerated because of the cheesecake on top. Set it out for about an hour before serving so the brownies aren’t cold.